Free Shipping Included! 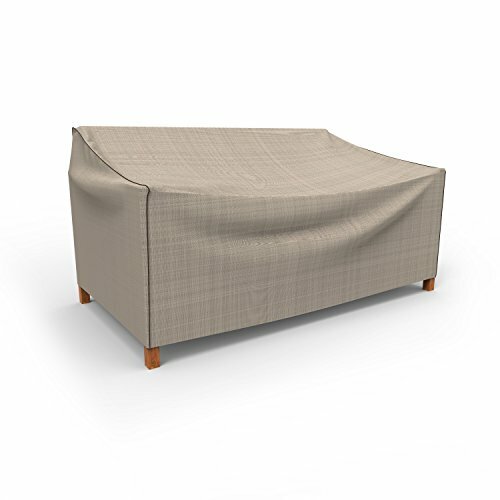 Budge English Garden Outdoor Patio Loveseat Cover, Medium (Tan Tweed) by Budge at List It Fort Lauderdale. MPN: P3W01PM1. Hurry! Limited time offer. Offer valid only while supplies last. The Budge English Garden Outdoor Patio Loveseat Cover, Medium provides high quality protection to your outdoor patio sofa, loveseat or bench. The Budge English Garden Outdoor Patio Loveseat Cover, Medium provides high quality protection to your outdoor patio sofa, loveseat or bench. Peaceful tranquility meets heavy-duty protection with Budge’s English Garden Collection. This collection features a rustic woven tan pattern that is accentuated by a dark gray piping, which lines the outer seams of the covers. Impeccably stylish, the English Garden Collection will compliment any outdoor garden or patio setting, all while keeping your furniture protected, rain or shine. This outdoor loveseat cover material is made from heavy-duty 600 denier polyester material that, through Budge’s own extensive research and testing, is proven to provide 100% waterproof protection to your outdoor patio furniture. This material will defend against fading, rain, sun, dust, bird droppings, tree sap and more. Four sewn-in straps are included to help better secure the cover to your furniture in windy conditions. The seams are ultra-sonically welded together to enhance both the protective properties and longevity of the covers. Vents are strategically placed throughout the covers to ensure adequate air flow to release any trapped condensation that may cause mold from growing under the cover. This patio loveseat cover measures 37" H x 56" W x 37" D.
If you have any questions about this product by Budge, contact us by completing and submitting the form below. If you are looking for a specif part number, please include it with your message.